This options allows you to get the fixture without a punching for a flush valve. Typically, this option is used for units with remote activation. As shown, this lavatory bowl is the most practical and traditional style. 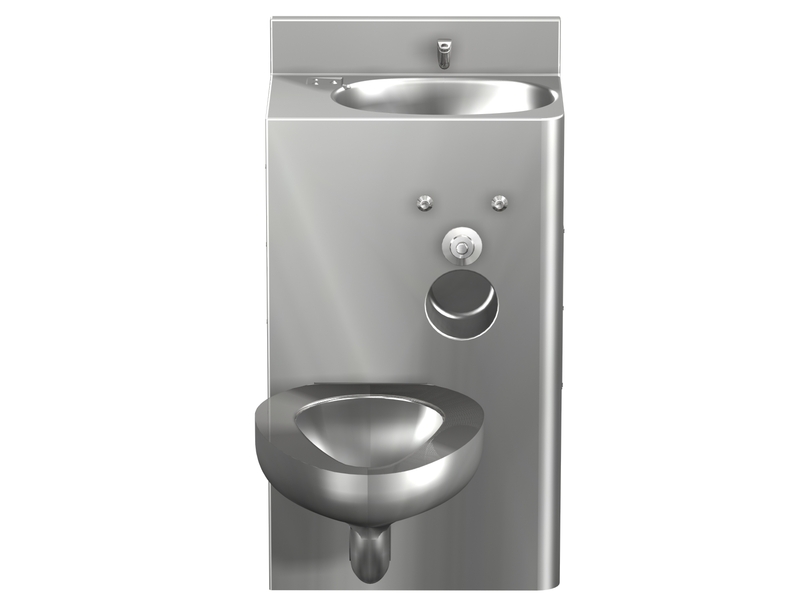 This option provides a full size, 16 gage galvanized steel template to aid in the rough-in of fixtures. Only one template required per job. This option provides lavatory or basin bowl with an overflow opening with connection to the waste outlet. Use of this option provides a vandal resistant valve pushbutton. The conical shape is designed to prevent use as suicide device. When specified on lavatories or combys, the Hemispherical Penal Bubbler (-BPH) is also recommended. This option provides a recessed toilet paper holder which accommodates standard sized rolls. The holder is fabricated out of stainless steel and is welded into the body of the fixture.Indicate location. This option provides an extended stainless steel toilet bowl housing skirt. This inhibits the use of bowl as a ligature or suicide device. Skirt extends to front of toilet bowl. This option is only available on On-Floor Toilets with Wall Waste (-2) or Floor Waste (-3). This integral stainless steel toothbrush holder provides a 9/32” x 9/16” opening and is constructed of 14 gage type 304 stainless steel with exposed surfaces polished to a satin finish. This option provides an “auto-release” towel/clothss hook that is tested to hold a minimum of 20 lbs and will readily support the weight of towels or clothes, but will automatically release into a downward position at 40 lbs or greater. Towel hook is fabricated of type 304 stainless steel with exposed surfaces polished to a satin finish. Hook is 3/8” in diameter and 1-1/2" long.